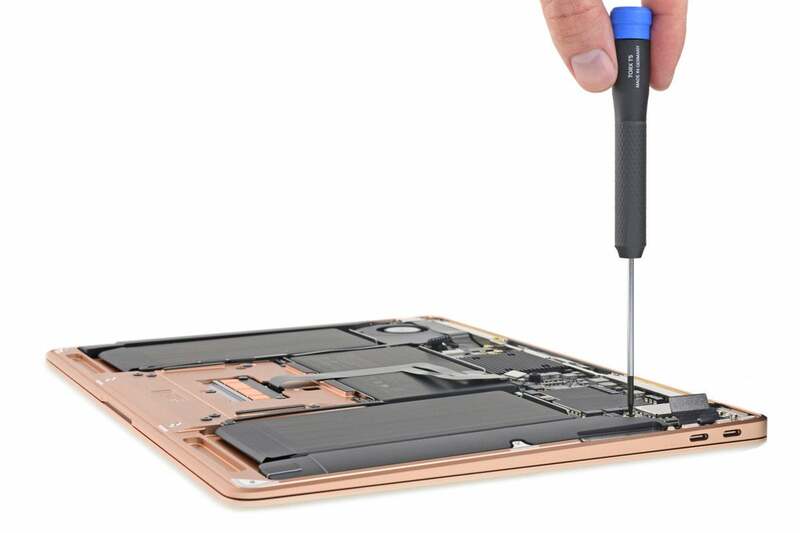 has completed its customary teardown of the new MacBook Air, and to its (and our) surprise, it’s not completely unrepairable. Whether it’s a sign of easing standards or a holdover from the old design remains to be seen, but if you buy one, you might actually be able to fix it on your own. Some of it, anyway. When Apple released its new MacBook Air, we pretty much knew the RAM and storage wouldn’t be upgradable, and that’s still the case here. Apple hasn’t had a laptop with easily-replaceable components since 2012, and the MacBook Air’s size is a dead giveaway that Apple isn’t interested in letting people take it apart. The RAM and storage are soldered to the motherboard, so you’ll need to buy what you need from the outset. Apple offers twice as much RAM (16GB) for $200, which is pricey but probably worth it. And you can get up to 1.5TB of storage as well, so consider your options before you decide to buy. The new MacBook Air in all its component glory. However, the new MacBook Air isn’t a black hole of repairability. While you’ll need a pentalobe screwdriver and some serious patience, iFixit found that Apple uses iPhone-style “stretchy adhesive pull tabs” rather than “gooey solvents” to keep things in place, meaning “someone at least thought about possible repair and disassembly situations.” You won’t end up with a sticky mess on your hands when you try to take apart your MacBook Air. Of note, the new butterfly keyboard includes the “ingress-resisting” membrane on each key that was introduced with the MacBook Pro earlier this year. So an errant piece of food shouldn’t render your new MacBook Air useless. The easiest thing to replace is the ports. Because the Thunderbolt ports are modular and “sit on their own boards,” you don’t need to replace the whole logic board to fix them. The same goes for the Touch ID sensor and the battery, which is secured by “four screws and six friendly pull-to-remove adhesive strips.” It’s all packed very tightly, so you’ll need to remove the logic board and speakers first, but at least it’s possible. The ports on the MacBook Air are modular, so they can be replaced without getting a whole new logic board. All in all, iFixit gave the MacBook Air a repairable score of 3 out of 10. That’s low, but it’s a lot higher than the 1 earned by recent MacBook and MacBook Pros. And it’s close to the 2015 MacBook Air, which received a slightly higher score of 4 due to a friendlier placement of components. 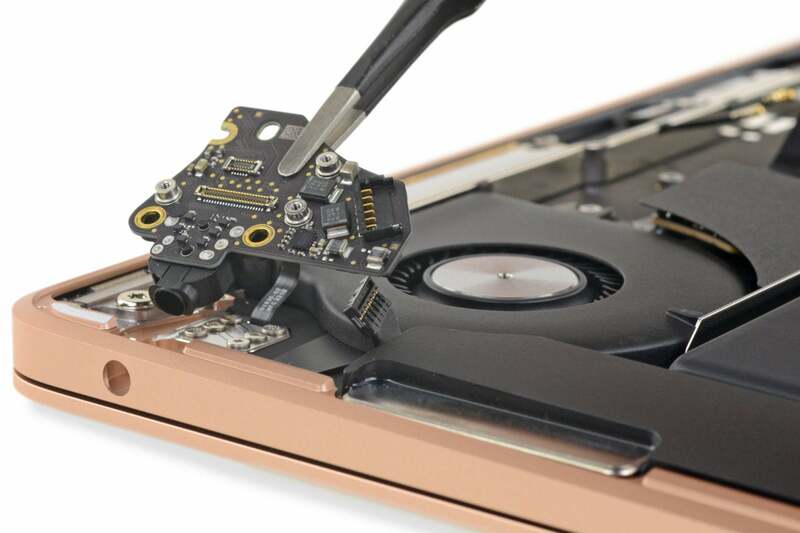 Why this matters: One of the worst things about Apple’s recent laptops—aside from the butterfly keyboard—is their repairability. Apple has made it a point not just to discourage home and non-Apple-technician repair, but to make it virtually impossible. The MacBook Air isn’t a return to amateur tinkering, but it’s definitely a step in the right direction. Hopefully Apple continues to ease up on its staunch no-repair philosophy.